...your contract apparel printer since 1992! Welcome to AzCa Embroidery. We are your one-stop shop for contract embroidery and contract screen printing. Since 1992, AzCa has been decorating apparel for the advertising specialty and uniform industries. AzCa Embroidery only works on a contract or wholesale basis and is not available for walk-in or other retail embroidering or screen printing. AzCa Embroidery is committed to giving our wholesale customers the highest quality embroidered and screen printed apparel, at the most competitive prices with the fastest turnaround times in the industry. We only work with resellers such as asi members and other advertising professionals, promotional products distributors, graphic designers, and fellow screen printers and embroiderers. You supply the apparel, and we provide the embroidery or screen printing. AzCa Embroidery is one of the few embroidery shops left that offers on-site digitizing. We use the most up-to-date embroidery digitizing software available. This software allows us to create a custom embroidery file from the logo or design that you provide. Simply send us your artwork and tell us what type of garment it is going on (hats, pique polos, denim, etc) and we will give you a quote within 1 business day. To speak to someone at AzCa Embroidery by phone, please dial: 888-374-2922, locally: 480-946-3663 or to fax a request: 888-374-2922. 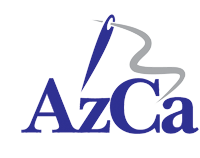 AzCa Embroidery & Screen Printing is based in Tempe, Arizona. However, we do business with every state in the USA!